In January of 2011, southern Sudanese voted almost unanimously for independence during a referendum on the question. The outcome solidified their course to statehood and fulfilled their long awaited dream of self-determination. While the vote generated palpable excitement, it also confirmed the daunting challenges of state building. By nearly all development indicators, southern Sudan remains one of the poorest and most conflicted places on earth. It lacks roads, schools, potable water, medical infrastructure, ports, and many other hallmarks of basic development. Its nascent government is comprised almost entirely of former rebels, many of whom have little practical knowledge regarding institutional development and state building. Its military is a patchwork of formerly warring militias whose allegiance to the central government is, in some critical cases, questionable. Nearly ninety percent of its citizens are unable to read and write and provisions to rectify this problem are far from sufficient. Perhaps most importantly, its people remain deeply and violently divided along tribal lines and numerous armed groups are prepared to compete for shares of power in the new state. When I arrived in southern Sudan in 2009, I did so with only a general understanding of the dynamics at play. In the almost three years since then, I have been humbled, deeply and repeatedly, by the complexity of the southern struggle and the respective identities of those who waged it. The land is vast and boasts astounding topographic, cultural and political diversity. On the basis of environment, its numerous tribes and sub-tribes have developed distinct identities that, while of continual personal intrigue, give me pause in my assessment of the future here. For decades, the popular discourse surrounding war in Sudan has been situated in broad, north-south terms. The southerners, who are ethnically African and largely Christian, were seen as clear victims of a cruel, anti-western and strictly Islamic regime in the northern capital of Khartoum. While this framework deserves its prominence, I believe that at this critical juncture it is a dangerous obfuscation of the deadly rivalries between the southerners themselves. Throughout much of the south’s struggle against the north, localized conflicts between southern groups over territory, cattle, grazing grounds and prideful egos were a significant source of death and destruction. As the northern government often exploited internal conflicts for its own gain, much of this violence has been excused as externally concocted. These conflicts persist to devastating ends with more than 1,000 southerners having lost their lives in internal clashes between January and May 2011 alone. The politics and posture of the south’s ruling Sudan People’s Liberation Movement (SPLM), the political wing of the rebel Sudan People’s Liberation Army (SPLA), are cause for concern. Members of the largest southern tribe, the Dinka, dominate the party and the government institutions over which it presides. The Dinkas formed the backbone of the SPLA and thus, when peace was reached and the SPLA/M became the interim government, many coveted posts were allocated to ranking Dinka commanders and token number of their non-Dinka allies. Consequently, members of the south’s numerous other tribes feel marginalized and whisperings of discontent and conflict are already in the air. For the time being, the social glue of liberation ideology creates an identity bond between southerners. From arid pastoral plains to lush agrarian fields, across scores of languages and varied cultures, the yearning for independence was profound. The struggle for freedom and the sacrifices made to attain it define the existing national identity of the new South. I fear, however, that when the common denominator of the north becomes a thing of the past, that a new form of factionalized identity politics could prevail and that a new era of internal conflict and suffering might soon begin. I hope I am wrong. I am humbled by and grateful for the opportunity to document this critical and complex period of South Sudan’s history. My experiences in this vast and diverse land have taught me more about the enduring challenges of nation states than any amount of academic study ever could. I hope, above all things, that the proud and determined people of this newborn Republic can find peaceful solutions to the inevitable challenges ahead. Of all the world’s people, they deserve a break. Southern Sudanese from the pastoralist Taposa tribe take part in a nationalist celebration in the remote area of Kapoeta. Support for southern independence is strong even among groups in the most desolate areas. Like numerous pastoral tribes in the south, many rural Taposa have little access to or strong interest in acquiring formal education. Despite a general lack of intellectual or practical connection to the institutions of independent government, the desire to see it come to fruition is overwhelming. A survivor of a recent massacre in Fangak, southern Sudan on Thursday, April 7, 2011. The massacre occurred when forces loyal to rebel General George Athor attacked the to town of Fangak on Feb 9th and 10th, 2011. When the fighting ended, more than 200 people were dead, many of whom were civilians. Gen. Athor began a rebellion in April 2010 after losing gubernatorial elections in southern Sudan's Jonglei state. The rebellion has expanded significantly since then with large numbers of youth joining Athor's ranks. 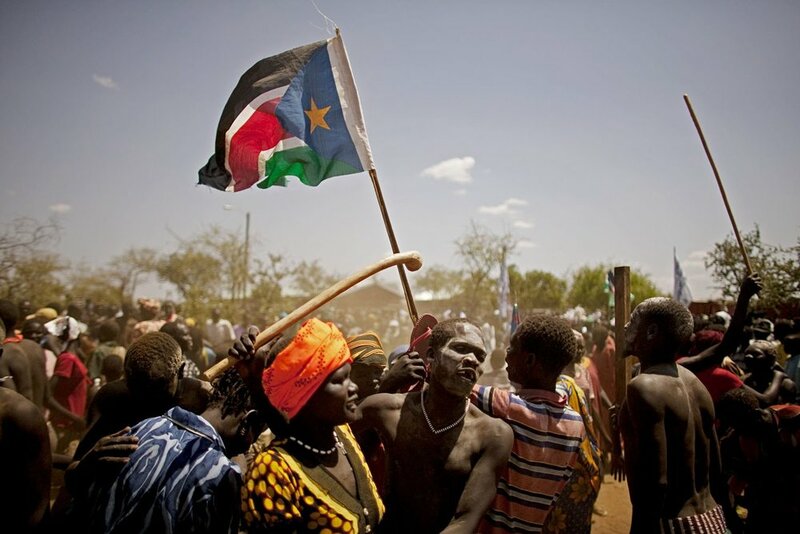 Southern Sudan is set to become the world's newest country in July 2011. Nuer tribeswomen in the remote town of Akobo, near the border with Ethiopia. Akobo has been devastated by intertribal fighting since the end of the civil war in 2005. Nearly 1,000 people were killed in fighting there in 2009 alone. A woman from the highly marginalized and deeply distrusted Murle stands with her cattle at dawn in Pibor. A woman tends to her garden in the fertile lands along the southern border with Uganda. The tribes in the deep south are agriculturalists and differ significantly in collective personality from the semi-nomadic pastoralists of central southern Sudan. Some in the deep south believe that their region should receive their own form of independence. There is great tension between the deep southern, agricultural tribes and the Dinkas, the region's largest and most powerful group. Dinka's moved to the deep south in large numbers after they liberated those areas during the war. They expropriated land belonging to the native tribes, an issue that generated tremendous resentment. Southern Sudanese Catholics prepare for Easter mass in Wau, the south’s second largest city. Christianity is a vital component of southern identity and was significant source of conflict between southern tribes and the northern, Islamic government in Khartoum. The north’s historic imposition of Islamic law throughout the south was a grievance that helped to galvanize the southern liberation movement. Northern Sudanese traders pray at a mosque in the volatile southern town of Malakal. Thousands of northerners live in the south where they own businesses and facilitate trade with the north. Such traders are the commercial lifeline between southern border towns that are cut off from Juba and therefore dependent on goods from the north. As the south approaches independence, the citizenship and residency rights for long-term northerner traders is in question. Internally displaced southern Sudanese outside a church that is serving as a makeshift camp in the village of Mayen Abun, southern Sudan on Thursday May 26, 2011. Tens of thousands of southern Sudanese fled heavy fighting in the hotly contested border town of Abyei earlier this week. More than one hundred people have holed up inside the Mayen Abun church, south of Abyei. Owing to the intensity of the fighting, many people fled their homes with nothing. International humanitarian organizations are moving to supply them with even the most basic of goods and services. 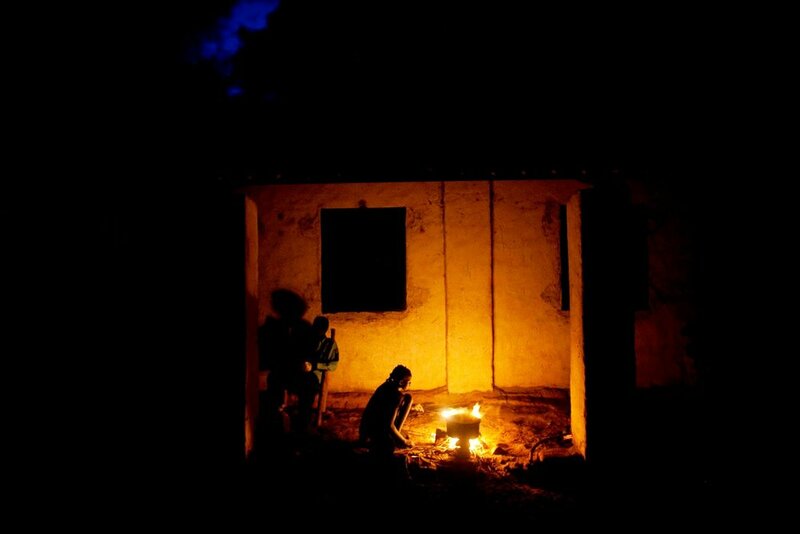 An internally displaced girl from Abyei sits around a small fire in a makeshift IDP camp in the village of Mayen Abun, southern Sudan on Thursday, May 26, 2011. Tens of thousands of Abyei residents fled the hotly contested border town when heavy fighting between northern and southern Sudanese forces erupted earlier this week. Thousands sought refuge in Mayen Abun, a small trading center to the south of Abyei. The fighting left the northern Sudanese army in effective control of the disputed territory. Southern soldiers stand guard on the roof of the airport in Juba, southern Sudan's defacto capital city. Southern Sudanese youth rally for secession in the capital city of Juba. Throughout 2010, youth movements campaigned heavily to bolster support for southern independence in the lead up to a referendum in January 2011. 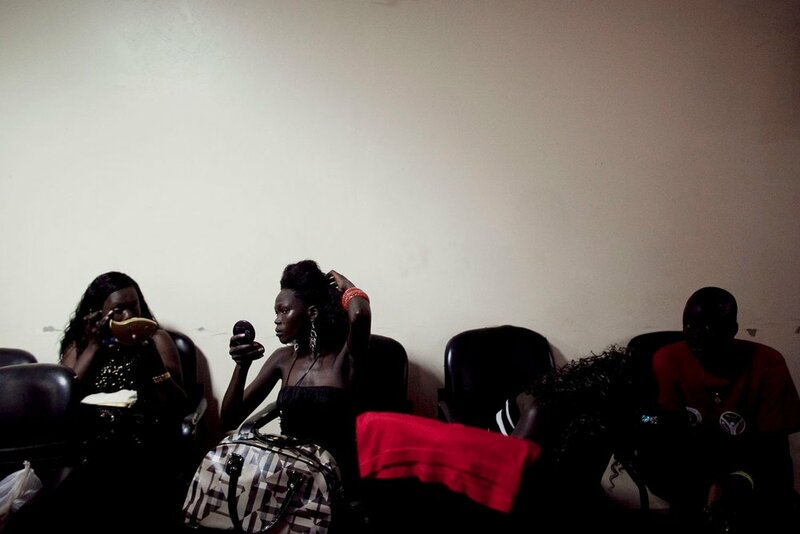 Southern women prepare to compete in the annual Miss New Sudan beauty pageant in Juba. The annual event is attended largely by members of southern Sudan's emerging business and political elites. A young boy eats ice cream inside the only shop that sells it in southern Sudan. The appearance of ice cream in Juba is part of a development trend in the rapidly expanding capital city. A southern Sudanese doctor looks out over the male surgical recovery ward the main hospital in Bentiu, the capital of southern Sudan's oil rich Unity State. The state of medical care in the south is dismal with too few, understaffed hospitals trying to deal with rampant medical challenges. Southern Sudanese election observers and political party agents sit inside a polling station in Juba, southern Sudan during the country's historic presidential, parliamentary and gubernatorial elections in April 2010. The elections were the first to take place in Sudan since 1986. 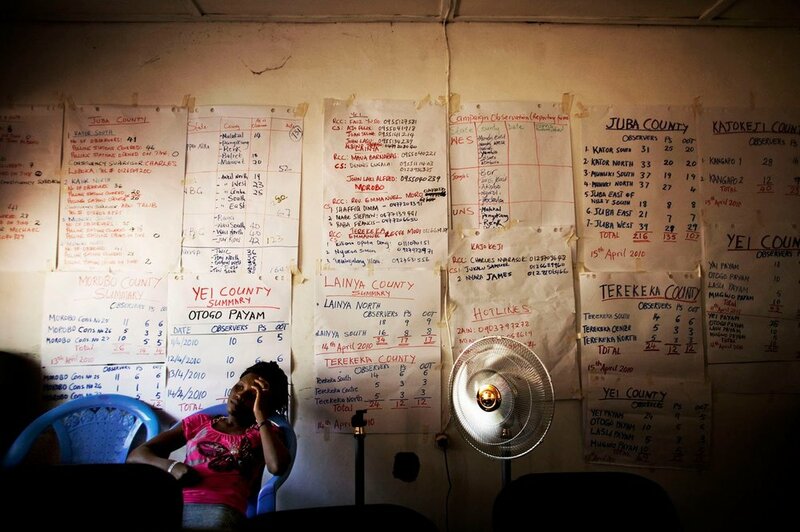 A civil society election monitor sits in her office at the end of presidential, parliamentary and gubernatorial elections in April 2011. With a scarcely educated population in the south voting for numerous candidates on more than 10 separate ballots, the elections were regarded by international monitoring groups as some of the most complex to date. The elections were rife with tension and intimidation as the ruling SPLM party moved to silence dissenting and independent candidates. A southern woman in a town close to the north-south border registers to vote in the independence referendum. Millions of southern Sudanese registered and voted in a long awaited referendum that set the region on track to secede from the north. Heavily armed members of the Sudan People's Liberation Army, the main rebel movement that battled northern Sudanese forces from 1983-2005. Now functioning as the national army, the SPLA struggles to transform from a guerilla to a professional fighting force. The army is deeply factionalized, largely along tribal lines. Troops remain loyal not to the institution, but to specific generals who commanded them during the war. Salva Kiir (C-green sash), the President of the Government of South Sudan and Riek Machar (2nd L) release a dove upon Kiir's return from the United States. The two men were bitter enemies during the latter years of the civil war in southern Sudan. Machar aligned with the northern government in Khartoum and used his forces against Kiir and other SPLA commanders. The relationship is emblematic of the tense and distrusting alliances that define the southern political landscape. 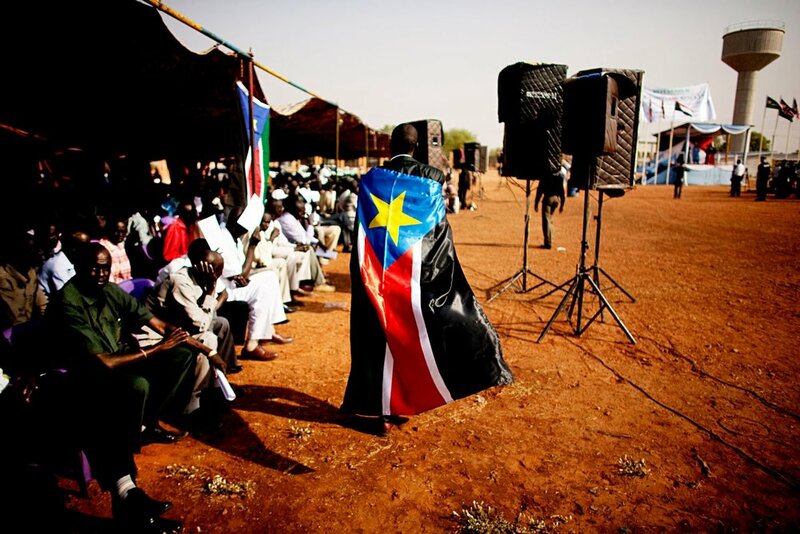 A man dons the flag of the Sudan People's Liberation Movement during a rally in Juba.